My Little Pony has always been one of those franchises that most people judge instantly. It seems like a show for little kids with happy creatures that you can’t take seriously. It is a kids show, but one that’s well written and has a lot of quality episodes. As I’m about halfway through season 1, I can finally consider myself a part of the fandom. Now I’ve gotten to read another MLP comic and I’d certainly say that this is a good one although I definitely found myself missing the Main 6. There are 6 stories and each one is a self contained adventure although the series is hinting at some kind of plot getting ready to develop with the scholar who is reading the stories. The first comic is a story about Princess Celestia and Luna from their Pony days. Celestia apparently was still a bully even back in her youth and picks on Luna a lot. She reminds Luna of her previous failures and points out that she will never be proficient in magic. Luna tries to show Celestia that she is wrong and opens up a portal, but it takes Luna away to a dangerous place. Celestia goes along with the Wizard to save her, but it’s a treacherous journey and her power alone may not be enough to win. It’s a pretty fun way to start the comic although it solidifies the fact that I will never become a Celestia fan. She’s just so mean throughout the comic to the extent where it’s hard to believe that she becomes one of the Princesses. It’s easy to see how Luna turned evil for a little while if she had to put up with this every day. I’ve always been a Luna fan so I’m glad she finally gets her due respect in the modern episodes. Her magic eventually did become more impressive than Celestia’s. Our next story takes us to good ole Rockhoof, a legend among his people. He was a Pony who stood up for what’s right and defeated many powerful adversaries in his day. This story takes place after the legend most are familiar with and he is invited to join the army. He does, but gradually begins to put on a lot of weight as his fans take him to many dinners. He is then too weak to defend the kingdom from a powerful monster and begins to wonder if friendship isn’t magic. The other characters confirm this so he goes back to his rigorous training and makes it in time to stop the giant monster on his own. He finally realizes that hanging out with friends is all right, but at the end of the day you can only count on yourself. It’s a pretty reasonable story and while I would have liked a fight as opposed to words being enough to stop the monster, it’s a resolution that I can get behind. I’d like to see Rockhoof show up in the present at some point. The next story was quite a bit weaker than the first two. There once lived an old nanny who liked to traverse the wilderness. One night, she noticed that a kingdom was being attacked by animals and no work was getting done. She decided to broker a treaty between the two which is fortunate since Luna had been sent out to deal with the threats. Not officially, but Luna noticed unlike all of the others and would have certainly beaten the animals on her own. Instead, friendship prevailed and Luna altered the Kingdom’s plans so that it wouldn’t interfere with the wildlife. Even back then Luna was a more benevolent ruler than Celestia. The story wasn’t bad, but it wasn’t quite as exciting or action packed as the first two. The old lady also didn’t make for as good a main character as the other ponies. Following that adventure was the original Wonderbolts as they struggled against a Tornado. This tornado was going to rip through the lives of many griffins, but the Ponies were declined access across the border. The Griffins wanted to deal with the problem themselves so the Pony commander decides to let them all die. The other Wonderbolts can’t agree this and quit so they can help out without causing a big war between the two species. It’s a pretty noble gesture and I always knew the ponies had it in them. The commander looks pretty bad, but don’t they always? It’s a good adventure even if it’s not the most interesting one. Again, it’s a comic without any of the old characters so you do miss them quite a bit. Rockhoof’s story pulled it off, but it is a difficult thing to do for sure. On the next adventure we meet our first Egyptian pony. She was known as one of the wisest ponies in all of Equestria and she solved all of her problems without the need for violence. A pretty impressive feat when you consider how unruly and dangerous most of Equestria was. One day her kingdom was being attacked by a large snake so she decides to deal with the issue. She’s a pretty great main character and a step up over the last two stories. She may even be the best main character in the book. It’s a fun enough story and who doesn’t like seeing a giant monster show up? This is one character who would definitely fit right in with the Main 6 if she ever met them. A pacifist is always welcome in Ponyville and especially one with Twilight Sparkle’s intelligence. Finally, the last story was about a bunch of Pony zombies. This may seem a little out of place in the happy world of My Little Pony, but again, you can’t let looks deceive you. A wandering healer happened to be passing by and decides to cure the Ponies. Unfortunately they aren’t too grateful and make fun of her one liners. Ah well, everyone’s a critic these days. The hero didn’t have a whole lot of personality this time around, but she seemed nice enough. Someone you would want to have in your corner at any rate. So this was a good batch of My Little Pony stories. It’s always good to expand the universe so having a whole comic series dedicated to this is pretty clever. That being said, the main plot could easily overshadow the stories if the series isn’t careful. It ends in a cliffhanger with the kid trying to find Twilight so that could be intense if it’s played straight. I don’t like that guy, but I guess he didn’t really do anything wrong in the comic so I have to cut him some slack. As always the writing is solid. These stories could easily have been boring or simply bad if we had a bunch of crude humor and bad characters to bring the story down. Fortunately this wasn’t the case as everything was on point instead. The stories were able to develop naturally and at worst some parts would just be a little rushed since all of the stories had to end rather quickly. They never drag on though and most of the characters seemed pretty reasonable. If you’re going to make a trade paperback about new ponies, they’ve got to be good and the comics did good there. Unfortunately, the art isn’t very good though. In fact it’s actually pretty bad at different points. It comes across like a cash in although I’m sure they put a lot of effort into the comics. The art just feels unfinished which is a little regrettable. It’s still clear though and you always know what is happening so it’s far from the worst case scenario. It’s nothing that would seriously hurt the score or anything like that. Hopefully it does improve as the series goes on the artist gets more used to the characters. Overall, I’d recommend checking out this graphic novel. It may not have the Main 6 and can feel like filler at times, but the stories are good. It’s a pleasant enough read and you’ll find yourself blasting through the pages. I would even say that it does beat the main ongoing comic so that’s definitely pretty impressive for a spinoff. Hopefully the library gets more MLP adventures soon so I can check them out. In the meantime I can be satisfied knowing that I’ve learned more about the world and its history. 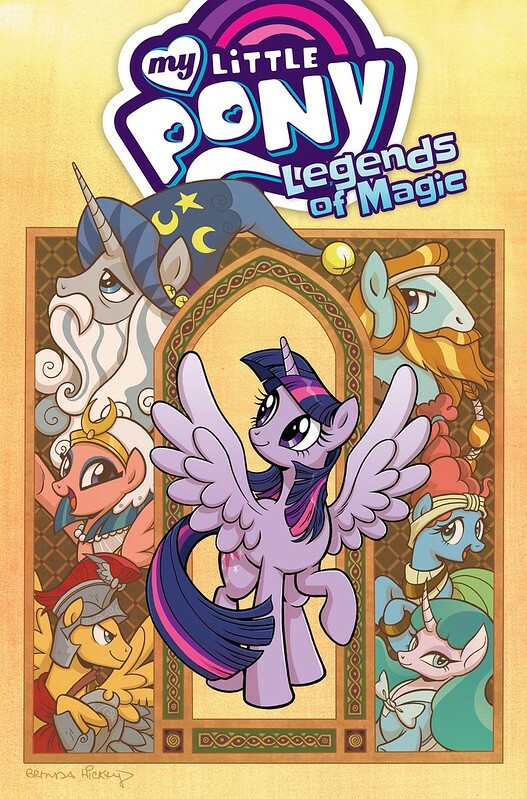 This entry was posted in Comic Reviews, Comics, Reviews and tagged Adventures, Comic, Comic Review, Friendship, Friendship is Magic, Hasbro, MLP, My Little Pony, My Little Pony: Pony Legends, Review, Slice of Life, Spinoff by dreager1. Bookmark the permalink.